A sense of coastal terroir began to take shape in our minds during a tasting with Cameron Murphy, estate director of Cape Mentelle. Cameron Murphy, estate director of Cape Mentelle. Photo: Credit Bonnie Yap. Cameron Murphy, estate director of Cape Mentelle, spends four months a year traveling the world to spread the gospel of wine. Arriving on Malaysian shores recently, Murphy met us at a luncheon held at The Point Restaurant & Bar and hosted by Moët Hennessy Diageo. Bottles were uncorked and the conversation flowed just as easily as the wine. Although we avoid subscribing to clichés, the following is true: we were blown out of the water by the libations, particularly the Sauvignon Blanc Semillon 2017 and Cabernet Sauvignon 2013. Marked by a laser-cut minerality (said to stem from the winery’s proximity to the ocean), the fermented grape juice unleashed a barage of questions about Margaret River in Western Australia. 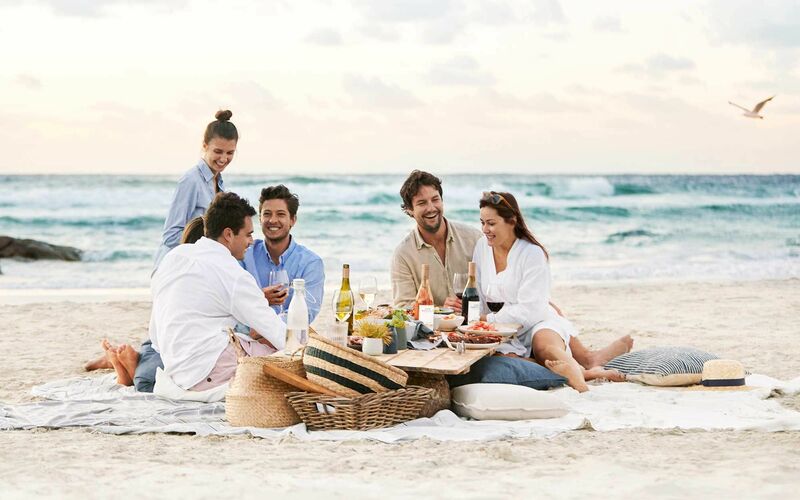 Margaret River, a surfers paradise and culinary haven in Western Australia. Photo: Courtesy of Cape Mentelle. What is accommodation like at Margaret River? Simply great. You have three options: you can either stay in town, which has only 1,500 residents, or you can stay on the beach, which is my recommendation. Go with friends so you can easily book a beach rental or an Airbnb. It doesn’t matter if you stay in the north or the south of the peninsula; you’ll have a hundred wineries surrounding you. There is everything from pop-up chalets to glamping and beach shacks to serviced apartments. Our winery is exactly halfway between the town and the coast. I’ve got a house on top of a hill and 180 degree views of the ocean for ten kilometres. If I ever make it home from work early enough, I get this beautiful sunset that dips into the Indian Ocean. Cape Mentelle's sprawling vineyards in Western Australia. Photo: Courtesy of Cape Mentelle. Is your affinity for the wine industry hereditary? It wasn’t my parents’ major line of work, but my father has always had vineyards in New South Wales. In the 80s when wine still wasn’t a very big part of Australian culture, he’d bring his own bottle and glass to a restaurant if he wasn’t happy with its wine selection—and I’d get really embarassed. We’ve shared a couple of small side projects with wine. It’s been fun. No, how I fell into wine was through studying hospitality and hotel management for many years. After I left school, I traveled quite a bit through Europe. I discovered wine while working for some of the bigger hotels in London and from being exposed to fantastic wine lists. I was so inspired. Upon returning to Australia, I was tasked with ordering wine, which turned into selling wine. By this point, I’ve done everything: front of house, distribution, marketing, and now land management. See also: What do your genes say about your wine choices? A burst of slate in Cape Mentelle’s Sauvignon Blanc Semillon 2017 gives freshly shucked oysters an extra edge. Photo: Credit Bonnie Yap. What is Cape Mentelle’s ethos? Our business is built on the spirit of exploration and innovation. We’re always looking for new techniques to get the best out of our vineyards. We’re not about just sticking to a recipe, but try to build a culture where mistakes aren’t an issue. Very cool. So different from the Old World. That’s the cool thing. We aren’t bound to the same rules, so long as the benchmark is always great wine. We’re not a commodity. We’re into making fine wine. I have to get my hands on one of Cape Mentelle’s Cabernet Shiraz blends, as that’s quintessential Australia, isn’t it? The Cabernet Shiraz is being released in the US market exclusively... and initially! Hopefully by the 2018 vintage, we’ll have expanded into other markets. In fact, we’re looking to potentially replace one of the existing reds with it. The Cape Mentelle cabernet Merlot 2015 paired with chocolate lava cake, raspberry coulis, pistachio, and rum & raisin ice cream. Photo: Credit Bonnie Yap. Wine production statistics from 2016 show that the New World, Australia included, did much better than its Old World counterparts. What are some contributing factors? The exciting thing about Australia is that even though we’re actually exporting less volumetrically, the value of our wine is increasing. I think Australia was caught up in overproduction in the early 2000s, whereas now we’re interested in regional expressions; Margaret River is one of those great ambassadors for a specific sense of place. Specific wines from iconic regions are doing a lot better than homogenised wines. Can you name a character who is regarded as the godfather of the Australian wine industry? Just as Robert Mondavi is to California? We’re so proud of David Hohnen who established Cape Mentelle. Is this the same Hohnen behind New Zealand’s Cloudy Bay? Yes! When you think about it, what Hohnen did was extremely brave and pioneering. He had moved to areas where few had planted grapes before. When Cape Mentelle won Australia’s most prestigious red wine trophy not once but twice, it helped to put Cape Mentelle, Margaret River and Australia on the map. Imagine all the red wines made in Australia; just one gets the Jimmy Watson trophy. No one really paid any attention to the west coast, and certainly not to Margaret River. So when Cape Mentelle won its first trophy in 1983, everyone thought it was a fluke. Then we won again the next year. We’re still the last winery to clinch that award for two consecutive years. David Hohnen has been honoured by most bodies in the wine industry in Australia. Just last May he was awarded the Order of Australia—just one step down from a knighthood—for his contributions. Drinks What Do Your Genes Say About Your Wine Choices?